Logo floor mats are the perfect addition to any lobby or reception area! Create a custom logo mat and make a lasting impression with your clientele. Our custom floor mats are printed with leading-edge digital printers. This ensures crisp designs that are both functional and aesthetically pleasing. Greet your visitors with personalized floor matting products using a near-limitless array of vibrant colors and textual effects. Logo mat printing effects include fading, shading, and 3-D imaging! Be sure to browse our collection of Hog Heaven mats, an industry leader in high quality indoor/outdoor matting. Or you can build a custom Waterhog Mat and receive laser-cut precision with Waterhog's patented in-lay printing technology. 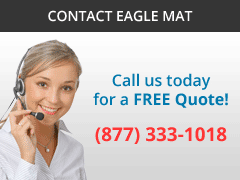 As always, Eagle Mat offers free image upload and proofing with each order! Graphic Impressions Logo Mats use state-of-the-art digital printing technology to create the sharpest image for custom logo mats. One of the industry’s most popular logo mats. Mat is ideal for highly trafficked indoor areas. Supreme Carpet Logo Mats are the finest quality carpeted surface logo mats in the industry. These custom mats feature “sewn-in” logo design guaranteed to produce a flush finish. Vibrant color combinations available for outstanding logo detail. Logo design is woven into the dense matting fiber for a guaranteed flush finish. Waterhog Logo Mats use a patented razor-cut inlay process that creates the sharpest logo possible! Waterhog crush-resistant “nubs” form a waffle pattern that delivers excellent traction. 100% commercial grade Nitrile rubber backing and borders for advanced slip-resistance and moisture control. Berber Supreme Logo Mats are one of the most popular in the industry. The distinct Berber pattern of this custom floor mat is great for trapping dirt and extremely popular among Class A buildings. Also available in custom floor tiles for easy installation. Our finest and most popular selling heavy-duty logo floor mat! Logo mat features distinct Berber pattern designed for heavy traffic areas. Logo created with laser cut inlay process to deliver unparalleled detail and precision. Rubber Scraper Mats are made of 100% Nitrile rubber for long-lasting durability and superior slip resistance, even when wet! Logo mat images are scratch resistant and heat pressed onto the mats surface. Ideal for traffic indoor and outdoor areas. Raised scraper ridges provide excellent tractions while effectively scraping the dirt and moisture from the soles of shoes. Pyramid Rubber Mats are finely hand-cut into solid rubber matting by skilled artists. This rubber inlaid entrance mat is constructed with a molded pyramid top and knob back, making cleaning a breeze, while providing superior traction for highly trafficked areas. FREE set up and proofing of your image. Non-skid traction, resilient floor mat surface, fast draining, and easy cleaning. Now available in squared or beveled edging for any surface mounting. Precise inlaid rubber provides unparalleled detail for even the most intricate logo design. Hog Heaven Anti-Fatigue Mats are 100% commercial-grade rubber comfort mats. These custom floor mats deliver exquisite comfort while proudly displaying your company logo on the surface of the mat. Most comfortable logo mat on the market today! 5/8” or 7/8” thick closed-cell cushion backing for long outstanding comfort. Multi-layer floor mat construction flexes underfoot to stimulate blood flow and reduce fatigue. Flocked Carpet Logos are felted onto the surface of the mat, producing a raised logo design from the surface of the floor mat. The cut-pile carpet is super absorbent and ideal for logos consisting of only one to two colors. Ideal for moderate traffic for indoor and outdoor areas. The nylon flock is permanently felted and heat-pressed into the surface of the mat creating a clear, bold projection of the logo raised off the logo mat's surface. Chesapeake Turf Mats feature a firm polypropylene construction with crimped fibers that makes for superior dirt scraping action. Logo designs are laser cut using a precision inlaid process. Heavy-duty vinyl backing for added slip-resistance. Firm polypropylene fibers effectively remove dirt and debris from the soles of shoes, keeping your lobbies clean and dry. Vinyl Link Mats are manufactured using rectangular links that are bound together with industrial strength stainless steel rods. The stainless steel construction and vinyl links provide for superior long-lasting durability while offering a slightly different atheistic look. This logo mat is a favorite among U.S. Military facilities.